After Color Efex Pro refused to properly process the full 47,980 x 23,990 panorama (even on a computer with 64GB of RAM & 4x striped SSDs!) I resorted to splitting the image into 4x pieces with overlap between them to apply the post-processing. Not an ideal situation, but after an afternoon’s work I managed it without any visible joins between the pieces. 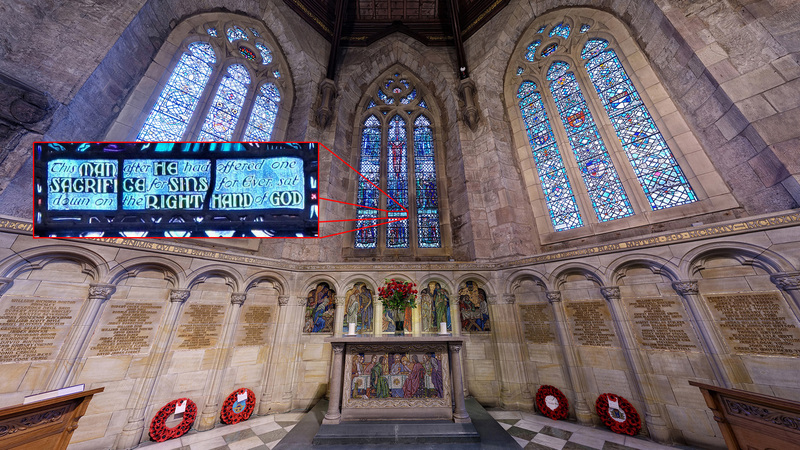 One of the next stages is to decide how to host it online so it can be viewed in a browser at its full resolution, letting you zoom right in to the detail. My experiments with Google Maps over the summer revealed a 100 megapixel limit, while Round.me seems to have a 25MB file size limit – neither of which are even close to enough for a 1.15 gigapixel image that is 224MB as a jpeg! So far krpano looks like it is going to be the winner, but we’re going to investigate some other options before we invest in a license. 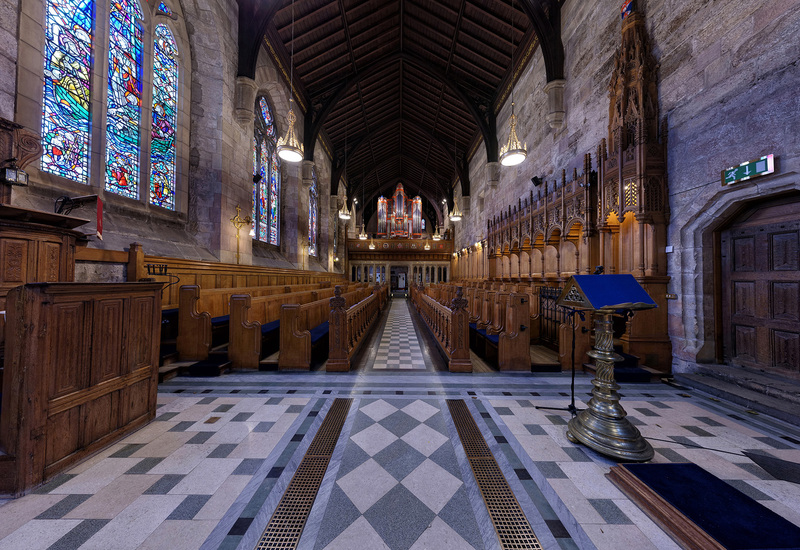 The Chaplaincy have expressed an interest in using the image in one of next year’s printed booklets, however as with many equirectangular panoramas the image looks rather odd when viewed flat – see the first image in the first post. But having the whole sphere around the camera & so many pixels to play with means that I can use PTGui to produce high resolution rectilinear images of arbitrary orientations. In a rather odd experience, it’s a bit like taking a photo in post…! Here’s one example – the full size version would be 26,542 x 15,272. And just to demonstrate the level of detail that the full panorama has, which of course means you can essentially zoom in when framing these rectilinear images in post, if you click the image beneath & view it at full size (1920 x 1080) the magnified section is 1:1. 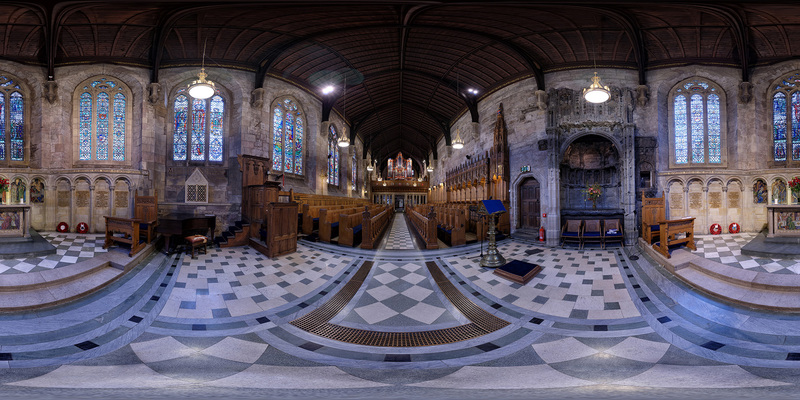 Had the opportunity to shoot a equirectangular panorama (photosphere) in St Salvator’s chapel earlier this week.